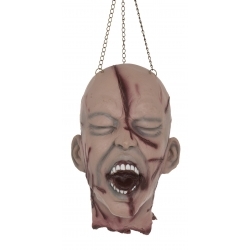 Included in our vast range of scary Halloween Decorations and Horror Props for sale in our Halloween Shop in Yeovil, Somerset, we have a ghastly array of Cut Off Heads designed to make the blood run cold. 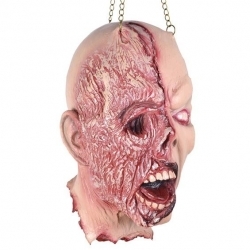 These bloodcurdling Horror Props include - Decomposed, Split Back, Mummy, Zombie, Burnt Face and Victim. 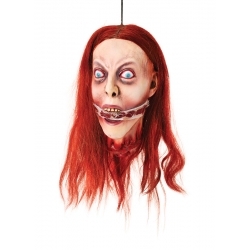 They are extremely realistic and should inspire limitless Halloween ideas. 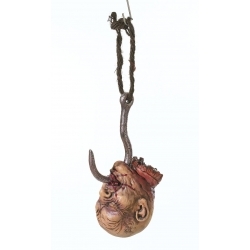 Each one has an attached cord for hanging but can also be placed in a bed, bath, or opened cuboard to create a scary scen or even in the toilet for a toilet trip to remember! 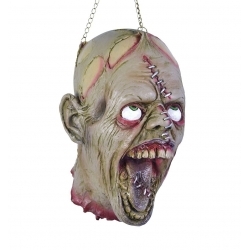 A Cut Off Head placed inside of our Body Bag Horror Prop will make a feature Halloween Decoration. 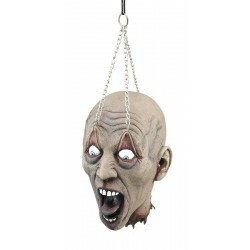 A Cut Off Head attached to our Hanging Spinning Motor will make it spin one way and then the other with the added feature of sound. 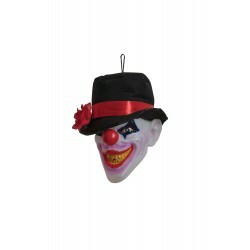 This is a Light up Clown Head with colour change feature. 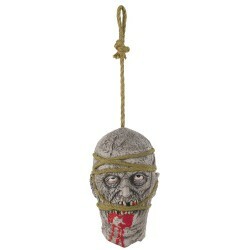 The hanging head is life size and batteries are included. This life size Skull with black ragged cowl will be the life and death of the party. Activated by the built in sound sensor, his eyes flash and light up as he utters the following phrases. ''Something spooky is out tonight....and I think its you! Ha, ha, ha. Have you come for a trick or a treat? Ha, ha, ha." 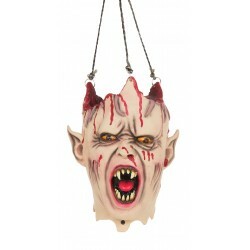 A great halloween prop to hang on the door.